All handbell choirs are under the direction of Gail Welk. For more information about any of these choirs, please contact Assistant Director of Music Ministries, Brenna Martin, bmartin@wesley-umc.com. 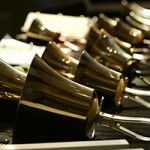 The Bells of Wesley is a handbell choir for adults including college age students. With five octaves of bells and six octaves of Choirchimes, there is always room for new ringers. The Bells of Wesley meet Wednesday evenings, 7:00 - 8:30 in the Chapel. The handbell choir rings monthly in worship and occasionally accompanies the choral ensembles. They also ring at events around the Bloomington-Normal community. 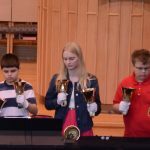 Celebration Ringers is a handbell choir for junior high and senior students. They ring monthly in worship in addition to ringing at outside community events. 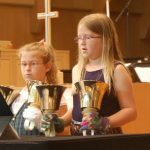 The choir is an opportunity to learn handbell techniques and offers a creative addition or alternative to the choral experience. Celebration Ringers rehearse on Sunday afternoons, 3:15 - 4:30 in the Chapel. Celebration Ringers are also part of the annual Choir Tour. This year's Choir Tour will travel to Iowa, Nebraska, and Colorado in June 2016. Hand-held Choir chimes are rung similar to handbells. The Chimes of Glory is open to students in 3rd - 5th grades and offers beginning ringing techniques and allows students to experience a creative addition to the choral music experience. Students progress on to ringing handbells as their experience increases. The choir rings monthly in worship. Rehearsals are on Wednesday evenings 5:30-6:30 in the Chapel.